Building upon the success and transferability of FCEEP’s watershed education model, decisions were made to expand the project for the 1999-2000 school year to include 14 additional schools in the Pittsburgh area, and a few more teachers in the French Creek Watershed. 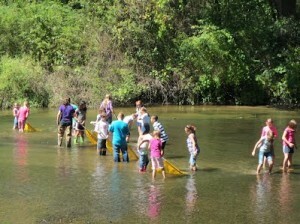 With the total of 33 schools and 44 teachers in two different corners of the state and New York, the project outgrew its name, and became Creek Connections in August of 1999. However, what has not changed is the project’s mission of bringing regional public schools an authentic natural science research experience and an appreciation for local waterways. Today, there are over 40 secondary schools and classes of over 50 teachers participating in Creek Connections.